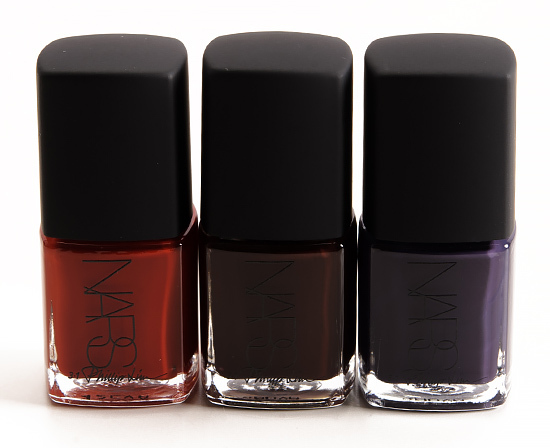 Nars Cosmetics and 3.1 Phillip Lim are launching a collection of nine nail polishes for Fall 2014 . After a 14-season collaboration the fashion designer and beauty brand are releasing a limited edition collection of nail polishes that will hit the store shelves on July 15, 2014 and will sell for $20.00. The names of the shades are perfect for the moody fall and range from african violet to bitter chocolate : Anarchy (Angora) , Crossroads (African violet), Hell-Bent (Lacquer Red), Shutter (Black sea green), Wrong Turn (Graphite), Dark Room (Blue denim), Gold Viper (Champagne), Other Side (Bitter chocolate) and Insidious (Black bronze). The colors it isnt new for me, but maybe aplied could be mutch different! The packaging are simple but pretty.